1 cup of ketchup or tomato puree with 1 tsp. sweetner honey, brown rice syrup, sugar, etc.. Thoroughly wash the chipotle peppers, remove the stems and place them in a bowl. Cover them with boiling water and weigh them down with a small lid or plate. Let them soak for 20 minutes. 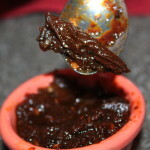 Remove 4 soaked chipotles, leaving the rest in the soaking liquid, and place them in a food processor or blender. Add the ketchup (or tomato puree with the sweetener) and half cup water. Blend until you have a uniform paste. Add the blended chipotles and tomatoes into the pot with the remaining chipotles soaked in water. Add the onions, garlic, salt, peppercorns and vinegar to the pan. Mix well. Bring it to a boil, reduce the heat and allow chipotles to simmer for about 1 hour and 45 minutes. Check them at one hour. If the sauce has dried too much, add extra water as needed. Place the chipotles and adobo in sterilized freezer safe containers. Hint - keep the containers small - most recipes only call for 2 peppers and a small amount of sauce. You can also puree and freeze them in ice cube trays for future use. Once you open your jar - be sure to use it within a month.